Being on the go and very dependent on my cellphone, I can guarantee 65% of my device's battery will be drained before noon. 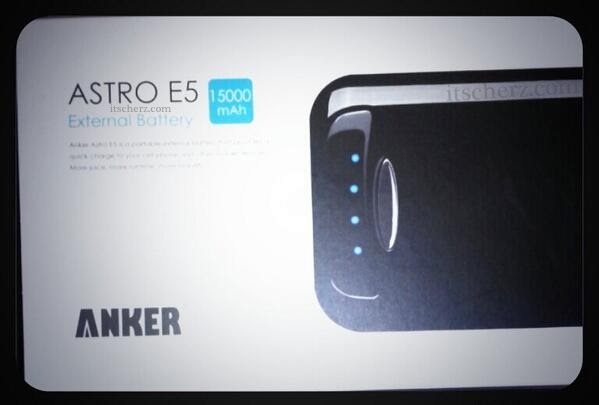 I had researched for months, read countless reviews, compared prices and decided to purchase an external battery. Wall outlet availability- I'm paranoid of leaving my electronics charging in public/someone's house. Never know who has access to it, or gosh forbid mistakenly take it. Trust me, I have gone to a store or cafe to find a free outlet and have sat there for 10 odd minutes just to get some battery life. Car charger - GPS/gadgets plugged in &/or the constant in-and-out from the car, devices don't get a decent charge. Invested for more voltage at the lowest cost. I had compared different brands and sizes. Anker was one of the top 3 list. It had arrived pre-charged, so I was ready to go. After 4-5hours to fully charge, I found this external battery can last about a week of heavy use until I need to recharge it. As it's charging I'm also able to plug my device in to charge as well. Anker Astro E5 is the size of a portable harddrive with two (2) charging ports. Unfortunately, it isn't pants pocket friendly but it's powerful to not leave home without it. So I don't mind at all. Two charging ports, the ability to charge multiple devices that have a usb cord. It arrived with device adapters to help you get started (micro, mini, and ipod). From my experience, it became a popular item during an offsite work trip. Ratio of available outlets were less than the amount of people attending. Anker Astro is aviable in two (2) colours, white and black. I purchased the Black. Very sleek looking but also a fingerprint magnetic. During power outages, this device not only charges your devices it also has an LED flashlight too! What a bright idea, no pun intended. Are you interested looking to purchase an external battery? Do you already own one?